From it's humble beginnings, in 1972, as a club organized to meet and share fellowship over a game of cards, the 60+ Club soon blossomed into the beginning stages of what it is today. By 1974 the 60+ Club was in full swing. They officially organized, elected a board of directors, an activities director was hired and they were now meeting in the old library building (currently occupied by the Carnegie Arts Center). Various fund raising activities, including their bean supper, were undertaken to raise money to fix up the old library building. As the club gained strength they expanded their activities. Soon hot meals were offered, along with activities, such as bingo, pitch & pinochle parties, pool tournaments, arts and crafts, for their members. With the growing number of members, the need for additional space and the desire to eliminate the steps they encountered at their present location, the board soon focused their attention to designing a new facility. With the input of their members, the Architect and the Contractor the board soon had the design for their new building and fund raising efforts we set in motion. The new building fund was established January 1983, with an anonymous donation of $10,000. The project was well received and with the support of the members and the community, the groundbreaking ceremony for the new Goodland Senior Center was set for June 20, 1983. The new 5,000 sq ft building (1,900 sq ft recreation room, 1,800 sq ft dinning room, kitchen, large storage rooms, restrooms, offices) was a vast improvement over the 1,380 sq ft building they were presently occupying. 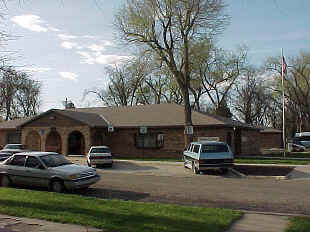 Rhoads Construction Co., Inc completed construction of the new Goodland Senior Center and the first meal served in the new facility was on October 20, 1983 with 147 members attending. Dedication and open house was held on October 30, 1983 with an estimated crowd of 400 on hand. The Goodland Senior Center continues to provide a hot meal and a place for members to gather and share in each others companionship. The Goodland Senior Center is open to all senior citizens. For more information about the 60+ Club and the Goodland Senior Center call (785) 899-5082.